Nurul Istikharah, better known as Lulu, is too scared to go back to Palu, the city where she experienced 36 hours of horror following a powerful earthquake. Now living in her ancestral home town in another province, the 16-year-old is determined to move on with her life, even though she lost her legs to the disaster. Lulu's home in the Balaroa area of Palu was among the areas decimated by soil liquefaction, a phenomenon unfamiliar to many Indonesians. That evening, on Sept. 28, Lulu, a 10th-grader at State Islamic High School 1, heard the call to prayer from the mosque and went to wash herself to prepare for the dusk prayer. With her at home were her mother, Risni, 45, and her 14-year-old sister Nurul Istikamah, or Isti. Her father, Muhammad Yusuf, 43, was out in the backyard tending to their chicken. Then, the earthquake struck. The 7.4-magnitude tremor threw their bodies around the house, and a cabinet collapsed onto Risni. But the three of them managed to escape from the house. They saw buildings falling down and the earth split. The soil was moving, mud was flowing out of the ground, and some water from burst water pipes was flooding their way. Later, they found themselves buried after concrete debris fell onto them. Unable to move, they could not help each other. Her mother was trapped next to Lulu, while her sister was trapped near her legs. Her father Yusuf was separated from them and had to climb over debris and wade through the mud to find his family. When he got to them, Lulu was the only one alive. Lulu said she had witnessed her mother and sister die before her eyes. Yusuf was determined to save Lulu but could not pull her out alone. So he found a hose and gave it to his daughter to breathe. Lulu stayed alive in that state for almost 24 hours, until the search and rescue team reached her on Saturday afternoon. They found her hugging her dead mother. The National Search and Rescue Agency (Basarnas) personnel did not have the right equipment to safely pull Lulu out. Pulling with force entailed the risk of breaking Lulu's legs. So her father made a difficult decision. "Pull her, it's ok if her legs break, as long as she is alive. Do it, I'll take the responsibility," Yusuf told the Basarnas personnel. The rescue took hours. The team had to pump out water from the hole where Lulu was stuck in. In the early hours of Sunday, they managed to free Lulu. The team took her to Undata Hospital in Palu. The doctors could not save Lulu's legs, so they asked for Yusuf's permission to amputate them. Yusuf saw no other option but to sign the form of consent. But her uncle insisted they get a second opinion and convinced Yusuf to take Lulu to the family's hometown in Pasangkayu regency of West Sulawesi. Upon arriving there, they found the regency did not have a hospital, only a community health centre (Puskesmas). The doctor there said the same thing: Lulu's legs had to be amputated, and it had to be done fast as the infection was spreading. So the family took her to Makassar in South Sulawesi, the most developed city in Sulawesi. This time, the decision was quick. The legs, from the knees down, must go. Last Friday, after being treated for a month at Wahidin Sudirohusodo Hospital in Makassar, Lulu was allowed to go home. But Lulu no longer calls Palu home. "I don't want to go to school in Palu anymore. I'm scared," she told The Jakarta Post. So they stayed at a relative's house in Makassar. Yusuf, who had lost his job because of the earthquake and was staying in Makassar with his daughter, did not have the money for them to leave. After some word of mouth via WhatsApp groups, however, several donors chipped in to finance their return to their ancestral home of Pasangkayu, from where they had moved to Palu nine years earlier. Now in Pasangkayu, Lulu is eager to go back to school and says she would like to have artificial legs. Charles Ham from the HOPE Worldwide Indonesia foundation said he would see to it. "We will help Nurul and we will bring her to Yogyakarta to measure the artificial legs," he said. 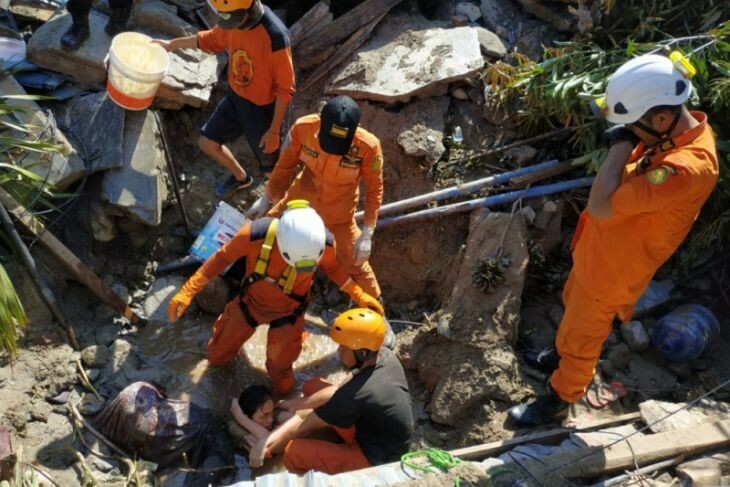 The Palu earthquake, which triggered a tsunami and soil liquefaction, killed at least 2,086 people in Palu and the regencies of Donggala and Sigi.